Dr. Lynn is a TPA/DPA certified optometrist in the examination, diagnosis and medical treatment of vision correction and ocular disease. She received her Bachelor’s degree from Emory University in 1997, and her Doctorate of Optometry from the Illinois College of Optometry in 2001, graduating with honors. She then completed a post-graduate residency program in primary eyecare and ocular disease management at the Illinois Eye Institute, a clinic affiliated with the University of Chicago, in 2002. 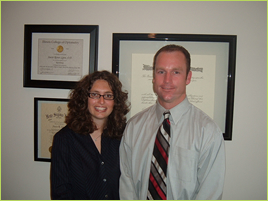 Dr. Lynn is presently an Assistant Clinical Professor at the Illinois College of Optometry, Chicago. She is actively involved in the education of optometric students and remains current in the optometric field by her involvement in the latest clinical research in Chicago. 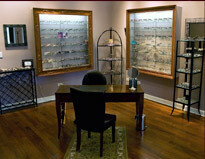 Dr. Millsap is a TPA/DPA certified optometrist and licensed by the state of Illinois. He received his Bachelor of Science degree from the University of Nebraska-Lincoln with a major in Biology, and his optometric training from Illinois College of Optometry, where he graduated in 2001 with honors. During his training, Dr. Millsap honed his skills at very renowned clinics across the United States, such as the Children’s Eye Doctors in Redmond, Washington, Wolfe Eye Clinics in Iowa, and the University of Chicago Hospital Eye Clinic. He has been practicing optometry in the Chicagoland area since 2001 and is excited to continue offering his knowledge and expertise to health care in Chicago. Our full-service optical boutique offers high-quality, limited edition frames from the leading designers in the eyewear industry.